This latest generation of MINI models is the best yet and they all come with a heaping dose of BMW polish. 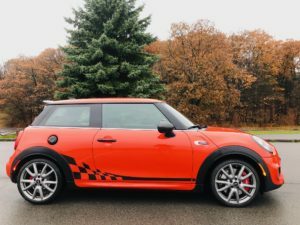 Now, if you’re looking for one that really stands out in the crowd check out this new John Cooper Works International Orange Edition. I’ve been super-impressed with the new crop of MINI models, constituting a higher level of maturity with all of the fun still intact. And the lineup showcases greater diversity. But if it’s a more powerful MINI you want, built with performance parts and designed with signature elements it’s the John Cooper Works cars you’re after. The JCW treatment, if you will, is available on all variants except the Hardtop 4 Door. And then there’s this limited production, special edition model, new for 2019. Available as a Hardtop 2 Door, the International Orange Edition features this bursting hue, black side stripes, edition specific spoiler, carbon fiber mirror caps, and chrome tailpipe trims. And the rubber meets the road with 18” Dunlop max performance summer tires. Driving the front wheels is this JCW special: a 228 horsepower twin-scroll turbo-4, here with the optional 6-speed automatic transmission producing the fastest acceleration, gunning for 60mph in 5.9 seconds. Take a look at this crazy thing. It’s the Bluetooth controller for the JCW Pro Exhaust system. A double click opens the flap on the right exhaust pipe to deliver a darker, more rebellious sound. And it travels so you can impress your friends. Little did I know this is available through the Performance Parts catalog for a number of MINI models. It’s a fun little gimmick that when in full Track Mode provides those snaps, crackles and pops when you come off the gas. Driving a sporty small car is where it’s at for most driving enthusiasts and this JCW model is just so much fun. Now I’ve never driven one with the 6-speed auto before but it’s totally at home here with paddle shifters and really fast gear changes. Back off the throttle and enjoy those machine gun-like firing sounds from the sport exhaust; totally amusing. So tossable, so quick, so engaging this is as much fun as you’ll have with 228 horsepower. Absent of any notable turbo lag it is always go-time. Now, the sport suspension doesn’t care much for rough pavement, the cabin can get a little noisy and when pushed hard there is some understeer. But I promise you; this is always a car you’ll look forward to driving. Pricing starts at $42,450 including destination and that encompasses everything you see here minus the automatic transmission which adds $1,500. Now, I know what you’re going to say about the $44k as-tested price but let me attempt to make an argument here. Now first off, this is a premium car through and through. This isn’t just some cutesy cabin. This is uniquely awesome and fully stocked. I absolutely love the displays, the switchgear, the quality, the smartness; it is really well done. Next up, it offers the quintessential go-cart-like driving experience. I mean, this is pure fun on wheels. And lastly, you are getting a limited edition model with a personalized look. BMW’s influence is all over the place and that gives this MINI a fulfilling personality beyond its desirous driving dynamics. This infotainment system not only looks great, it’s packed with features and fairly easy to use. It’s a touchscreen, its natural language voice controlled, it rotary knob controlled. And the most exciting part is that BMW is the only company doing WIRELESS CarPlay; an awesome feature that eliminates the USB cable. Combined with this nifty wireless charge pad inside the armrest it’s my favorite setup on the market. The lighting schemes add excitement, the heads-up display is a nice get, the panoramic roof opens up the cabin, the 12-speaker sound system is immersive, and the Active Driving Assistant provides speed limit information, high beam assist and automatic emergency braking but no side blind zone alert. And it’s not nearly as small in here as it looks. It does seat 4 adults. The driving modes with Sport, Mid and Green settings integrate Dynamic damper Control for a trio of driving personalities, all distinguishable and appropriate; from eco-friendly to razor sharp. Speaking of which, 28mpg in a sports car is great even if it does require premium gas. But paddle shifting in Sport mode with the exhaust wide open is the JCW’s happy place. If you like what you see, get in on it early because supply of the International Orange Edition is a tight squeeze.